RENEW's Michael Vickerman is featured extensively in this article. At the very moment solar energy is becoming an affordable, realistic option for homeowners and businesses, the state’s largest utility, We Energies, is attempting to strike a fatal blow to this emerging industry. In its latest rate request in front of the state Public Service Commission (PSC), We Energies is seeking to charge its customers more and also add new penalties to those who use renewable energy, making solar panels and other green systems less affordable for the average property owner. Renewable systems owners represent just a fraction of 1% of We Energies’ 2.2 million customers in eastern Wisconsin and Upper Michigan. But, plagued by flat sales in a weak economy and bogged down by the high debt service costs for the expenditures We Energies made in its fossil fuel-based fleet and transmission lines, We Energies is turning to its most energy-efficient and independent customers for new sources of revenue. Essentially, We Energies is asking its customers, who have tried to be more energy efficient, to pay higher fees to cover the costs for the backward-looking decisions We Energies made when it invested billions of dollars in what many people viewed as “dinosaur technology” 10 years ago. The We Energies executives got nice bonuses and we, the ratepayers, got stuck paying for these bonuses. Instead of promoting clean energy and energy efficiency or competing on a fair playing field, We Energies wants to punish it. In effect, if you use little energy—whether you’ve got solar panels on your house or not—you’re going to pay more for your electricity in January 2015 if We Energies gets its way. We Energies’ proposed rate change is focused on its fixed charges—the ones covering We Energies’ investment in the grid, what’s called a “facilities charge” on your bill—and the more variable energy rate. We Energies seeks to increase that base facilities charge from $9 month to $16 a month for an average homeowner. Customers with renewable energy systems would see additional charges. If granted, residential customers would see a 5% increase in their electricity rates next year, the Journal Sentinel reported. We Energies spokesman Brian Manthey said the strategy aims to be transparent by showing customers how their payments are being used. The monopoly is trying to sell its changes by insisting they’re “fair” by requiring all customers to pay into the grid, even those who only use it sporadically, such as solar owners. “The cost should not be shifted to others for the use of the grid,” Manthey said. But the net effect of We Energies’ proposal would be to increase the monthly bills of customers who use little energy, either through conservation measures such as installing energy-efficient appliances or through the use of renewable energy sources, such as solar panels. These customers will find little financial benefit from saving energy because that will be a smaller portion of their bill. On the other hand, heavy users of fossil fuel-generated electricity may see their bills decrease. Vickerman said We Energies’ plan is to make it appear as if they’re lowering the energy rate even though they are really increasing small customers’ total monthly bills. “They’re disguising a bill increase,” Vickerman said. And, making matters worse, two other Wisconsin utilities—Madison Gas & Electric (MG&E) in Madison and the Wisconsin Public Service Corp. (WPS) in Green Bay—are attempting to change their rate structures as well in their current cases before the PSC. If granted, the three utilities’ base rates will be the highest in the Midwest, according to an analysis by the Environmental Law & Policy Center. MG&E has already backed away from its original proposal. In addition to this change in billing, We Energies also seeks to impose new fees on customers who generate their own electricity, whether through solar, wind or biogas. Solar owners would see an estimated 30% increase in their bills, Vickerman said. Adding a new charge for all clean energy system owners simply for investing in their own system. Entities with solar investments would also be subject to a new $3.80 per kilowatt per month fee. The average homeowner with a small solar system would pay We Energies an estimated $192 annually. But it would also affect nonprofits like Habitat for Humanity, which installed solar on dozens of their homes; places of worship such as St. Marcus Lutheran in Milwaukee and Elm Grove Lutheran; businesses such as Johnson Controls, GE Health Care and Kohl’s; schools and universities including MATC, UW-Milwaukee and the Milwaukee School of Engineering; and local governments such as Milwaukee, Racine, Wauwatosa and Brookfield. A much higher fee would be placed on owners of biodigesters, such as the Potawatomi Bingo and Casino and the Metropolitan Milwaukee Sewerage District (MMSD). Steve Jacquart, intergovernmental coordinator for MMSD, said the district has invested in renewables to reduce the cost of cleaning water, which is energy intensive, and increase its energy independence and use of renewables. But We Energies’ proposal would drastically increase MMSD’s electricity costs, which no doubt will be passed along to everyone in its district. Reducing the buyback price for solar. Solar owners benefit the utility by selling back their excess energy, typically during peak hours, such as on hot, sunny days. This also helps solar owners recoup their investment in their system. We Energies wants to change this from an annual to a monthly meter check and pay solar owners far less for their clean energy. This means that it will take longer for a solar owner to pay off their system. We Energies, of course, can charge its other customers premium rates for this renewable-sourced peak energy, further increasing its revenues. Restricting third-party ownership or leasing of solar systems. Although it’s allowed in other states, We Energies is trying to ban, outright, any third-party involvement in solar energy. Third-party ownership is illegal in Wisconsin, but third-party leases, in which a solar operator sets up a system and rents it out to a customer, isn’t explicitly prohibited. Matt Neumann, owner of SunVest Solar in Waukesha, said his company has a thriving business in other states that allow third-party leases. But We Energies is trying to ban this type of operation in the state through its rate case pending before the PSC. Neumann said that policy discussion is better left to the Legislature—not We Energies. Neumann said We Energies’ proposal would have a long-term negative impact on Wisconsin’s solar industry by weakening companies such as his and making solar an unaffordable investment for property owners. Faced with competition for the first time, We Energies, a regulated monopoly, is trying to crush it instead of using it to upgrade its business model. Amy Heart, sustainability program manager for the city of Milwaukee, said We Energies’ proposal runs counter to the city’s attempt to become more energy efficient and independent, as well as the state’s energy policy, a statute that prioritizes renewables and efficiency over fossil fuels. “That’s the crux of the matter before the PSC,” Heart said. The PSC is a three-member panel made up of appointees of the governor. Two of the current members were appointed by Gov. Scott Walker—former Republican state Rep. Phil Montgomery, a former American Legislative Exchange Council (ALEC) Legislator of the Year for his work deregulating the telecom industry, and Ellen Nowak, the former chief of staff to Waukesha County Executive Dan Vrakas. The third member, Eric Callisto, was appointed by then-Gov. Jim Doyle. The city of Milwaukee, RENEW Wisconsin, MMSD and SolarVest among others have decided to intervene in the case. Members of the public are encouraged to file their comments with the PSC before Sept. 24 (Docket No. 5-UR-107) and attend a hearing on Oct. 8 in Milwaukee as well. Next week, Alderman Tony Zielinski will introduce a resolution opposing We Energies’ proposal, saying that it would increase residential customers’ electricity bills by 5%. “The proposed rate increase plan punishes those who use solar and other renewable energy systems that We Energies likely believes will threaten to take a few dollars out of the energy giant’s massive and bloated coffers,” Zielinski said in a press release. RENEW’s Vickerman, for his part, is going to fight it tooth and nail. RENEW is asking those concerned about the three Wisconsin utilities’ attack on solar power to make their voices heard. It’s published an action sheet at renewwisconsin.org/current.htm. The city of Milwaukee offers a fact sheet as well on its website at city.milwaukee.gov/sustainability. We Energies’ proposal would have a huge impact on Milwaukee, which was one of the first cities to earn the federal government’s designation as a “solar city.” In combination with its far-reaching sustainability plan, ReFresh Milwaukee, the city has encouraged energy efficiency and the installation of solar panel systems on homes and businesses. It developed two neighborhood group buys in Riverwest and Bay View, through which 65 homeowners—including this reporter—found an affordable and convenient way to go solar in the heart of the city. Mayor Tom Barrett just announced the expansion of the program to the Layton Boulevard West and Washington Heights neighborhoods just last week. Amy Heart said the success of the Milwaukee Shines program indicates that momentum is moving in the direction of solar. The city would move forward with its program despite We Energies’ proposal, Heart said. Steve Barnicki in Bay View just got his solar panels installed via the neighborhood program. An electrical and biomedical engineer, Barnicki said he thought it was wasteful to allow his attic to heat up to 120 degrees without harnessing it. He said he was totally opposed to We Energies’ plans to tax him because he invested in his own solar panels. We Energies claims it’s changing the way it charges solar system owners because it’s “fair.” It’s launched a PR campaign to explain that it’s going to charge solar owners more for their use of the grid so that it doesn’t have to shift costs to customers who rely on the utility’s traditional fossil fuel-generated electricity and infrastructure. Matt Neumann, owner of the solar installer SunVest, disagrees with We Energies’ concept of fairness. He said solar owners help the utility because they produce excess energy when the utility needs it the most—typically on hot, sunny days—and when it’s the most expensive time for We Energies to produce it. 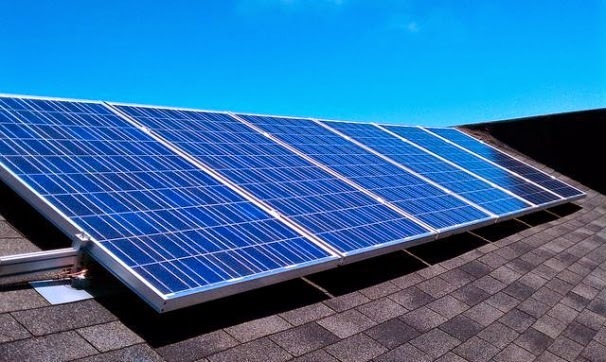 In addition, solar owners only use the grid when they are selling or receiving electricity from We Energies, not when they are using their solar-produced electricity on their properties. Therefore, it’s unfair to ask solar owners to pay huge sums for the use of We Energies’ grid, he said. “We shouldn’t have to pay the same amount for transmission expenses for all of our energy,” Neumann said. Michael Vickerman of RENEW Wisconsin said We Energies is being unfair by deciding to penalize customers it had encouraged to go solar. Since nonprofits weren’t able to utilize a federal tax credit for renewables, We Energies had developed a discount for churches, schools and other nonprofits that wanted to install solar.